Under federal law, colleges that record a student loan default rate of 30% or more for three consecutive years – or 40% in a single year – can lose their access to federal aid. While the rule is meant to weed out bad players and schools that don’t provide students with means for gainful employment, a new report shows that the government often intervenes, propping up schools just before they fail. The Wall Street Journal reports that since October 2001, just 17 schools out of 6,000 have failed to meet loan-default requirements resulting in their access to federal aid being cut off. In many cases, instead of allowing a school to fail and potentially having to wipe out billions in student loans, the Department of Education often helps troubled schools clear up their default rates. Take Arkansas Baptist College for example. When the school received a warning that its access to federal student aid was at risk because so many students had defaulted on their loans, the letter came with a little something extra: an offer to help. But instead of assisting the college in improving students’ financial well-being after graduation or investigating what programs might not be working out, a dean for the college tells the WSJ that for six months the Department of Education simply helped the college look for errors in its student loan default data. 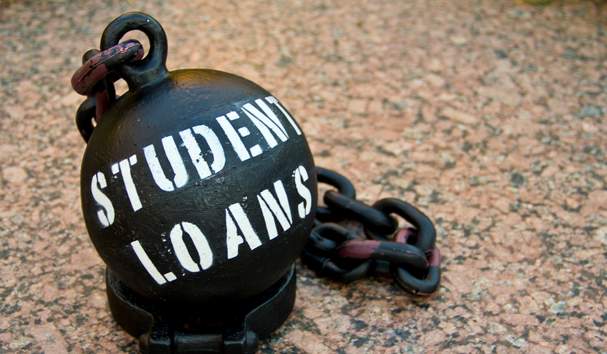 Student loans are considered to be in default if the borrower has gone more than 360 days without making a payment. Borrowers can often avoid default by delaying payments in some circumstances, like illness or unemployment. Yvette Wimberly, a dean with Arkansas Baptist, tells the WSJ that the college regularly held conference calls with the Dept. to provide updates on finding errors. In all, the school found that some students who had died were being counted toward the default rate, while others that were still in school for graduate programs were incorrectly counted. By fixing these issues and others, the WSJ reports, the school was able to cut its default rate to 26%, just below the 30% cutoff. Officials for the government say they do everything in their power to hold schools accountable, but critics say the willingness to help spot errors isn’t really assisting students. Ted Mitchell, undersecretary at the Education Department, says the agency’s willingness to help clean up default data stems from its desire to ensure that a college’s student-loan data are correct before punishing it. “For this to be a fair process, these sanctions must be based on accurate information,” he tells the WSJ. Despite helping Arkansas Baptist clean up its default rate, the school still ranked in the highest 1% of the 1,615 colleges whose defaults were analyzed by the WSJ. In the end, Arkansas Baptist’s nonpayment rate on student loans was 88%, making it the highest of any four-year college in the U.S.
For consumer advocates these rates are troubling, and show that the tactics used and loopholes made available by the Dept. of Education signal the agency is more reluctant than ever to shut down troubled schools. In fact, the WSJ analysis of schools found that in 2014 the agency reduced the loan-default rates for an undisclosed number of colleges before releasing data publicly. Officials with the Dept. of Education tell the WSJ the assistance was related to students with multiple loans, which often causes data problems that wrongly punished schools. The WSJ reports that the Dept. also assists troubled schools by participating in informational workshops to teach colleges how to manage their default rates. In addition to receiving a helping hand from the government, colleges and universities have been able to exploit loopholes in the default calculation rate on their own. Such was the case for the now defunct for-profit Corinthian Colleges. Investigations into the school found that it coaxed former students to apply for forbearance – a student loans state that isn’t counted default rates – by offering McDonald’s gift cards. In another loophole, schools are able to skirt default rate punishment by showing that a loan servicer didn’t do enough to contact students about their payments. Lawmakers have attempted to revamp the process to hold schools accountable. In 2008, lawmakers tried to tackle default-rate manipulation, extending how long defaults are tracked to three years from two, the WSJ reports. While that effort succeed, lobbyists warned that the change would shut down dozens of schools. And so, the effort was largely thwarted when lawmakers agreed to compromise, raising the allowable default rate to 30% from 25%. According to the WSJ, the lower rate would have resulted in 82 additional colleges being at risk for losing federal aid. Despite these concerns, leaders at Arkansas Baptist say the school has since been able to improve financial counseling for students and is on track to have an even lower default rate next year.